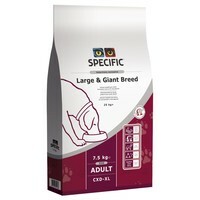 Specific Everyday Adult Large & Giant Breed CXD-XL Dry Food for Adult Dogs is a daily diet for healthy adult large breed dogs from 1 to 6 years of age, and giant breed dogs from 1 to 5 years of age. A complete and balanced diet designed to meet the nutritional needs of larger breed dogs, Specific Everyday contains a moderate level of energy and additional L-carnitine that work in combination to help them maintain an ideal bodyweight. Suitable for dogs over 25kg. Rice, Wheat, Fish Meal, Maize Protein, Pork Fat, Hydrolysed Poultry Protein, Fish Oil, Yeast (including Source of Beta-1,3/1,6-Glucans), Minerals, Eggs, Powdered Cellulose, Vitamins and Trace Elements, Psyllium Husk, Lysine, Methionine, Threonine, Tryptophan, L-Carnitine.